Plot Points are how most of our Savage Settings are constructed. The idea is to communicate a big backstory—like the flooding of the world in 50 Fathoms—but still give GMs the freedom to construct and run their own stories in the foreground. The other goal is to allow the GM to open the book and run an adventure almost instantly. For example, you may have a character in your 50 Fathoms Group who’s the daughter of Captain Kidd. Kyla Kidd has crossed over into the fantastic world of Caribdus to find her lost father (and his treasure!). The big backstory is about gathering certain information and artifacts to stop the world from being completely submerged in water—which will eventually destroy all the air-breathing species. Certain adventures—called Plot Points—reveal this information to the heroes and help them gather the things they’ll need to save the world. But the player’s primary motivation is still to find her father. Think of these like television shows that have an “A” story and a “B” story. Which is which depends on you and how you want to run things, but the backstory is there to provide context, NPC motivations, and fantastic locations. The real goal behind all this is to help Game Masters who don’t have tons of time to prepare their own game. 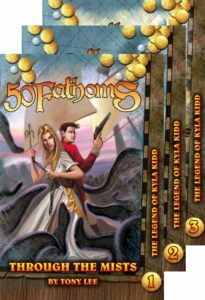 In 50 Fathoms, for example, a GM can start the overall campaign, figure out where the players are going, and read a short summary of that location. Then he can look at the points of interest at that site and see if there are any Savage Tales—short adventures—that his party might want to get involved with. Think of a Plot Point setting as a quick pick-up instruction manual for actually running a game session (almost) on the fly. The location descriptions are intended to quickly hone in on how the GM describes the area to his players, the plots—via Savage Tales—have enough detail to run a night’s session, and the bad guys or challenges are defined and statted—either as unique villains or by reference to the bestiary. Kyla Kidd has heard her missing father visited the Kehana Flumes, a series of chimneys in the Flotsam Seas that spew smoke and flame—and occasionally belch precious metals as well. The GM quickly looks up the Kehana Flumes and finds out what they’re all about. This is a short section so he can do this minutes before the game starts if he likes. Under the Kehana Flumes are some random encounters that can occur there, as well as a Savage Tale called Kehana Dissenter. That sends the GM to a Savage Tale wherein a savage fish-man—normally an enemy of surface-dwellers—offers to join the crew. The GM decides to flesh this out a bit more and decides the kehana—Stripe—will show the heroes where a load of precious metals is—if they’ll help him wipe out his sworn enemy, a brutal Kehana and a small group of bloodthirsty sycophants. Thinking up a backstory is pretty easy, but the real trick is encouraging players to interact with it while still pursuing their own personal goals. As a rule, you want to create a Plot Point campaign that sends players all over the “map” (whether that’s literal or figuratively). This way they’ll visit your locations and can interact with the Savage Tales you’ve set there. The tried-and-true method is to require the heroes to seek out information or items from all over the map. Maybe it’s like most computer games and they’re gathering a magical artifact that will help them defeat the Evil Overlord. Or maybe they have to travel throughout a ruined wasteland performing tasks for various tribes to they can unite them against a common foe. Regardless of the actual story, the point is to have your heroes scouring your campaign area or world looking for trouble. 1) Introduction: Geared for both players and GMs. This section tells you what the world is all about, what the big backstory is, and who the adventurers typically are. Maybe a quick overview of the world goes here as well. 2) Characters: Any special rules for making characters, gear, or new Edges and Hindrances. 3) Setting Rules: Any new rules the particular setting needs, like rules for Superheroes in Necessary Evil, or ship-to-ship combat in 50 Fathoms. GM’s Section – The rest of the book is purely for the Game Master. 4) Gazetteer: A list of locations the group will travel to and the things they’ll see there. Locations should be keyed to Savage Tales to help the GM run adventures on the fly. 6) Bestiary: A complete list of all the creatures and common NPCs (such as guards or bandits) the players will encounter. 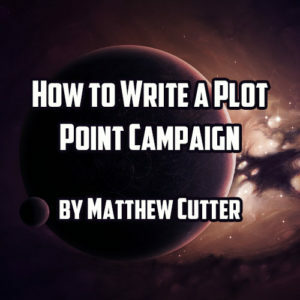 Main idea: The best Plot Point Campaigns maintain the overall story in a compelling way, at the same time making few or even no assumptions about who the characters are, or when each episode is to be played. First explain the backstory—everything that led up to the PPC—succinctly. Then provide an overall summary of the PPC, with each episode getting roughly 1 or 2 paragraphs. Assemble the characters at one location iconic to the setting or linked in some way to the overall Plot Point—preferably both! Everyone gets a turn to describe his or her character’s manner and appearance. In general, include as much “narrative space” as possible between episodes, unless it’s impossible to do so and maintain the storyline. [6. Denouement, usually short or nonexistent in RPGs]. The main antagonist(s) should have well thought-out goals and motivations. Incorporate some new, unusual, or unfamiliar terrain or location (or go the other way with a location iconic to the setting). Include a variety of Trait tests to appeal to a range of character types. Go beyond combat—although we recommend at least one fight per episode—and include social interactions, research, survival, Dramatic Tasks, Social Conflicts, Chases, etc. Include a combat scene…unless there’s a good reason not to! And not all potential combats need end in bloodshed. In a combat-focused episode, typically two combat scenes and a “boss” battle should be the maximum. End with the players knowing where to go and what to do next…unless the players not knowing what’s next is narratively important. If not, spill the beans. The Plot Point’s final episode should focus on the group’s epic showdown against the main antagonist and his/her/its allies. If the Plot Point featured any mysteries, all should now be revealed; all loose ends are tied. The final “battle” need not be violent—it could be a debate using Social Conflicts or a difficult Dramatic Task—but when it is violent, it should be a setpiece battle in a novel environment.